DailyObjects is an art and design focused smartphone accessories maker in India. The website also lets user to customize their stuff seamlessly. This leading smartphone cases manufacturer has a variety of collections in cases and covers for all phones. Here are some of the popular brands the site covers such as Apple, Windows, Samsung, HTC, Sony, LG, Lenovo, Google, Xiaomi, Asus, Motorola and more. Browse from over 5000 beautiful designs to pick from and shop. Accessorizing your smart gadget is very simple with DailyObjects. All you need to do is select your brand, model and get the best case. You may shop by collection, or search for smartphone cases, MacBook sleeves, notebooks, leather goods and much more at the site. Verified on 20/4/2019 .. Get flat Rs 100 off on orders of Rs 599 and above. This is a no cash offer on mobile cases and accessories from DailyObjects. No coupon code is required to avail this offer. Discount applies automatically at cart page on prepaid/online payments. Verified on 20/4/2019 .. Get flat Rs 500 off on orders of Rs 1999 and above. This is a no cash offer on phone cases from DailyObjects. No coupon code is required to avail this offer. Discount applies automatically at cart page on prepaid / online payments. Verified on 20/4/2019 .. Get flat Rs 250 off on orders of Rs 999 and above. This is a no cash offer on mobile cases and accessories from DailyObjects. No coupon code is required to avail this offer. Discount applies automatically at cart page on prepaid or online payments. DailyObjests offering 50% OFF on all tote bags which are listed on the offer page with different colors and patterns. Use has given a promo code to avail this offer. Hurry Up! Verified on 20/4/2019 .. Buy 1 and get 50% off on second product purchase. Applicable on orders above Rs 499. Choose from leather goods, smart phone cases, designer goods and more. Apply coupon code at check out page to get this offer. Verified on 20/4/2019 . 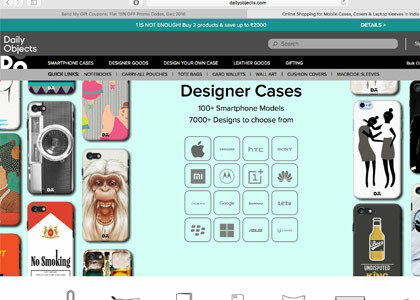 DailyObjects is offering flat Rs 400 off on various mobile cases. Min order value should be Rs 1499. You can choose wide variety of collections for men and women also. Apply this promo code at checkout process. Choose from the latest collection of mobile cases for your mobiles. Available for various mobiles like Samsung, Motorola, Lenovo, Xiamoi, MI, iPhone and more. Place your orders today! Buy 2 products at daily objects and get third product purchase for free. Choose from leather goods, smart phone cases, designer goods and more. Apply coupon code at check out page to get this offer. Verified on 20/4/2019 .. Get upto 20% off on iPhone 7 cases at daily objects. This offer is applicable for both old and new users online. You can choose wide variety of collections for men and women from different case types, colors and more. No coupon code is required to avail this offer. Verified on 20/4/2019 .. Buy any 3 products and get the lowest priced product absolutely free. Choose from leather goods, smart phone cases, designer goods and more. Apply coupon code at check out page to get this offer. Verified on 20/4/2019 .. DailyObjects presents Buy 2 and get Extra 5% Off on Entire website. You can buy phone cases iphone se, iphone 6, iphone 6s, iphone 5s and more. Hurryup, Valid for a limited period, You don't need any codes for this offer. Shop Now. Verified on 20/4/2019 .. Get upto 20% off on iPhone 7 Plus mobile cases at Daily Objects. You can choose wide variety of collections for men and women from different case types, colors and more. No DailyObjects coupons are required to avail this offer. Verified on 20/4/2019 . Buy and get upto 30% off on Moto G4 mobile cases at daily objects. You can choose wide variety of collections for men and women from different case types, colors and more. No coupon code is required to avail this offer. Verified on 20/4/2019 .. Shop and get upto 20% off on One Plus 3 cases at daily objects. You can choose wide variety of collections for men and women from different case types, colors and more. No coupon code is required to avail this offer. Shop today! Verified on 20/4/2019 .. Get upto 20% off on Redmi Note 3 mobile cases at daily objects. You can choose wide variety of collections for men and women from different case types, colors and more. No coupon code is required to avail this offer. Shop now! Verified on 20/4/2019 .. Avail up to 21% discount on marble print cases at DailyObjects. Available in various colours, designs and models. You can choose for various mobiles like HTC< Blackberry, Xiaomi, OnePlus, Samsung, Apple, Sony, LG, Asus and lot more. Verified on 20/4/2019 .. Buy any 2 products and save upto Rs 2000. This DailyObjects offer is applicable on all the sitewide products online. No coupon code required to avail the discount. Choose from wide range of products like bags, cases, laptop skins and many more. Verified on 20/4/2019 .. Get upto 30% off on Moto G4 plus mobile cases at daily objects. You can choose wide variety of collections for men and women from different case types, colors and more. No coupon code is required to avail this offer. Verified on 20/4/2019 .. Purchase any two products and get additional 5% discount on your online shopping. This offer is applicable on various products like smartphone cases, MacBook sleeves, note books, customization cases and lot more. Shop today! Mothers Day Sale : Flat 12% Off on Rs.500 above. DailyObjects Presenting - Mothers Day Sale. You will flat 12% Off on mobile accessories which are order value Rs.500 above. You can buy mobile cases for Samsung, Apple, Htc Mobiles and more. Choose the best match for your mobile. Hurryup, Valid for a limited period. Choose from the latest collection of mobile cases for your mobiles. DailyObjects is offering flat 12% ff on various mobile cases. You can choose wide variety of collections for men and women also. Apply this coupon code at checkout process. Shop now! Are you fancy about Batman inspired collection in smartphones cases and covers? Or want to add a little quirky thing to your smart device with cheeky words or quotes? DailyObjects is here to take your fantasy into another level. It’s an online website to find a wide range of mobile cases, laptop covers, designer cases and customized phone cases for various brands at the best prices. Find designer and customizable cases for iPhone 5/5S, iPhone 6, Motorola Moto G2, HTC Desire 820, Mi 4i and much more. This store presents a great range of unique and authorized collection of artwork across the globe to its users at low prices. You will find thousand of cases for brands in smartphones, laptops and other devices, here are a few - Apple, Sony, Samsung, Motorola, Xiaomi, LG, Blackberry, Asus, Lenovo, Nokia and a lot more. The store also presents leather cable wraps, real wood cases, customisable smartphone cases, marble print cases, designer MacBook sleeves, etc. Looking for the latest and today’s DailyObjects promo codes? Find them here and save on your online shopping for smartphone cases, MacBook sleeves, notebooks. Browse smartphone cases within your budget and evaluate the right one based on your preferences and needs. And avail additional discount using DailyObjects promo codes that are exclusive for HappySale users.